Maricopa Police Foundation honored Maricopa’s “finest” its annual award ceremony Nov. 4. 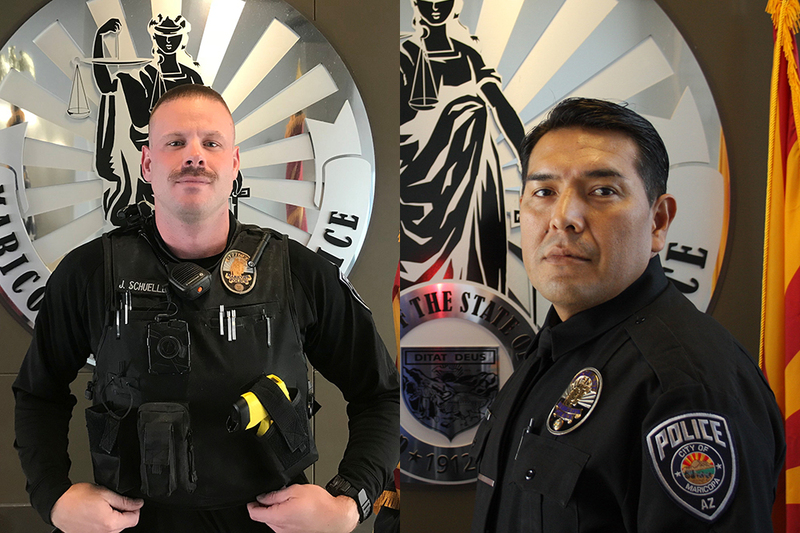 MPD veteran Elliot Sneezy was named Sergeant of the Year, and newcomer Jonathan Schueller was named Officer of the Year. Shawna Thies was named Civilian Employee of the Year and Dreama King Explorer of the Year. Barry Vogel and Kelly Hayden were named Volunteers of the Year. Least favorite part of the job: Knowing I or one of my brothers or sisters may not go home at the end of our shift. Proudest moment on the job: The day I got hired because becoming a police officer has been my lifelong dream. Scariest moment on the job: I have no fear; I have full faith and trust in my fellow brothers and sisters in this profession. Why did you become a police officer? I wanted to be a part of something bigger than myself. When others say they won’t go or won’t do it, I will go. Like most about Maricopa: I like how supportive the community is toward our officers. I have witnessed the random acts of kindness displayed by the kids and adults. Favorite part of the job: Being in the company of heroes. The officers I have worked with throughout my career have done amazing things that most people will never hear or see. I get to see and hear it weekly. Least favorite part of the job: The political aspects related to policing. Proudest moment on the job and why: When I received the Sergeant of the Year award in 2014 my daughter, who was 7 years old at the time, and my wife were there to witness it. The team that helped me earn the award was one of the best teams I had the pleasure to work with. At that time the officer of the year also came from our team. Scariest moment on the job: In 1996 I responded to a person who cut both of his wrists. While talking to him he backed into his backyard. As I was getting closer to him he grabbed a pitchfork that was on a table facing me and tried to stab me in the stomach. Luckily he only stabbed me in the palm of my hand to my wrist. I pulled out the pitchfork and wrestled him to the ground. Why did you become a police officer? When I left the Marine Corps I needed a job. There were no jobs that had much of a future. I applied for the police department and was selected. I didn’t realize it, but I became the fourth generation in my family to be a police officer. In 1994 I was nearly killed by a gang member. From that point my passion for working gangs became my reason for staying in law enforcement.